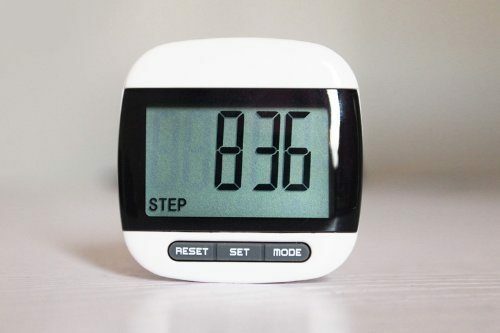 Mini LCD Pedometer with Calorie Counter $6.59 + FREE Shipping! You are here: Home / Great Deals / Amazon Deals / Mini LCD Pedometer with Calorie Counter $6.59 + FREE Shipping! Head over to Amazon and get this Mini LCD Pedometer with Calorie Counter for just $6.59 (reg. $12.97). And, shipping will be FREE! Step counter up to 99999 steps. -Distance traveled indication up to 999.99KM/999.99 Miles. Calories burnt indication up to 999.99 Kcal. -Metric and imperial system selection. -Auto shut off. -CE certification. Battery Usage -Uses Ag10 x 1pc (not include) -Unscrew battery cover to replace with fresh battery. Note: -Be sure to operate and maintain pedometer properly with care. -Do not disassemble parts, electrical components or replace back up battery. Doing so could cause damage and affect the accuracy of the pedometer measurement.